AppCobra is designed to let you create HTML5 and Mobile e-learning Apps for Desktop / iPhone / iPad / iPod Touch, Android, HP webOS, BlackBerry, and/or Windows Mobile based devices - even Smart TVs - on your Windows based computer - no programming required. Use a range of mobile / touch device features, including Geolocation, Acceleration, Swiping, and much more. Test your apps almost instantly on your own mobile, tablet or desktop device. Create both web based, and native e-learning applications. You determine how everything looks and operates. Match your own corporate style, or create a whole new look using our easy to use tools. 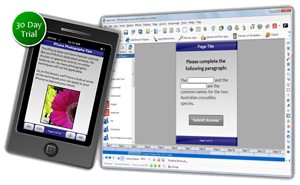 Create specifically for any HTML5 based device - or run the same app on all devices with our unique scaliingtechnology. Utilize features like geolocation, accelerometer data, WebKit styles and animations, touch gestures, and much more. Create presentations, assessments, quizzes, slide shows - interactive applications, games, and much more. Run from the web, or download to user devices for offline use. Run the very same apps you create on Desktop / iPhone / iPad / iPod Touch, Android, HP webOS, BlackBerry or Windows Mobile devices. Or any HTML5 device. Or on desktop browsers. HTML5 ensures complete compatibility. You are not restricted to any one device. The famous sport item - wholesale nba jerseys in our outlet. Shop for the wholesale nba jerseys is competitive enough to attract the customers.